In the two weeks before your THATCamp, make sure to contact registered participants and remind them to submit session proposals. Keep reminding them up until the day before the THATCamp. Be sure when you build your website to include an informational page about how to propose a session. You are free to copy and paste all text from that page (and indeed anywhere on the site). Include instructions, as well, about how to log in to the THATCamp site and how to post to the site blog. You should also make certain to publish a blank schedule on your website at least a month beforehand so that participants know how long session time slots will be and when they will begin and end. Then, about two weeks before your THATCamp begins, it’s a good idea to email the participants at least once (preferably twice, but not more than three or it’s nagging) to remind them to post a session proposal to the THATCamp site and to read and comment on others’ proposals. You can also use that email to let participants know about other logistical issues. Most participants will wait until a day or so before the THATCamp to propose something, and that’s fine. They can also propose things on the day itself. Because many people are unsure what an unconference session looks like, remember to emphasize that people should propose to Discuss, Make, or Teach something. To download a list of participants’ emails, you must be logged into your THATCamp website and have administrative privileges. 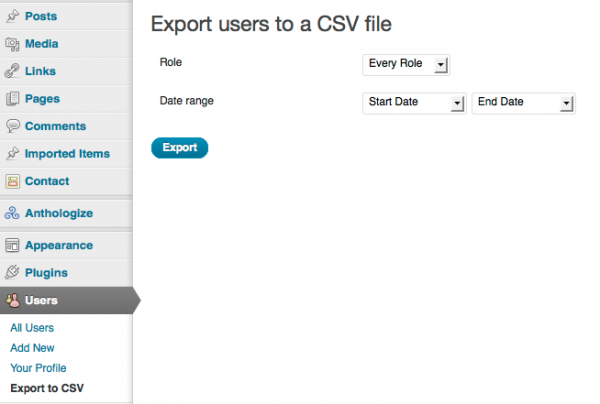 You can download a list of user names and emails at Users –> Export to CSV. Leave the “Role” and “Date range” dropdowns as they are to get a list of all users’ names and email addresses. The resulting file of comma-separated values can be opened in a spreadsheet program such as MS Excel. You can also export a list of registrants with all their registration information, including email addresses, by going to THATCamp Registrations and clicking the Export to CSV button in the top right. The resulting file of comma-separated values can be opened in a spreadsheet program such as MS Excel. Below is a sample call for proposals: see more sample calls for proposals here. Thanks for registering for THATCamp NCPH (and OAH)! We’ve got over 65 registrants so far, and will be continuing to accept registrations on-site in Milwaukee and at ncph2012.thatcamp.org/register so long as we have space. Soon after you receive this email, you should also receive login information for the THATCamp site at ncph2012.thatcamp.org. When you receive your login info, head over to the site, log in, and update your profile. Your information will be displayed at ncph2012.thatcamp.org/campers/. 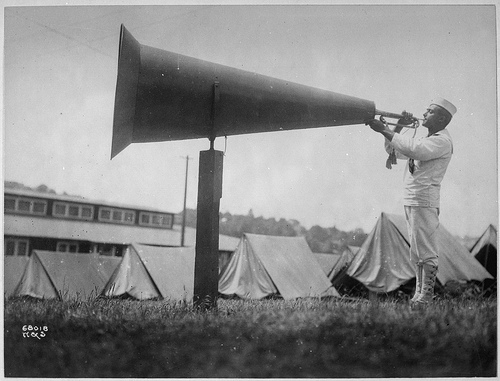 Now is also the time to start thinking about what you’d like to do or discuss at THATCamp. From now till THATCamp NCPH begins on the morning of April 18, you can propose one or more session ideas by logging in to the site and posting your idea(s) as a blog post by clicking Posts –> Add New, writing out your idea, then clicking “Publish” on the right to publish to the site. See ncph2012.thatcamp.org/proposals/ for more information about how and what you might propose, not to mention a little bit of explanation about why things work this way at THATCamp. People are already posting their ideas — read through them and comment at ncph2012.thatcamp.org. The registration desk opens at the Frontier Airlines Center at 8:00 am on Wednesday morning. All registrants should come by the registration desk on Wednesday morning and pick up their name badges and registration materials before going to THATCamp. We’ll all work together to set the day’s agenda starting at 9am. Write us at ude.i1555794919upui@1555794919hpcn1555794919 with any questions, and follow @THATCamp and the #thatcamp hashtag on Twitter to see what’s going on at other THATCamps around the world. Hope you find THATCamp fun, productive, and collegial. Some THATCamps and unconferences are experimenting with other means of soliciting session ideas, including the All Our Ideas site and User Voice. AdaCamp DC 2012 solicited session proposals by email in the weeks before the event. Whatever method you use, just be sure to get people interested in the event beforehand. Otherwise, with nothing officially scheduled, even registered participants might not bother to come at all, especially if they’ve never been to an unconference before and are therefore uncomfortable with the notion of waiting until the event itself to decide an agenda.